Does officer have to do accident report? Many times I will have folks come in to my office shortly after a wreck to find out what their rights are. 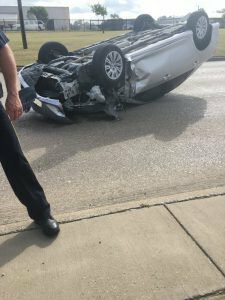 Often, they will have with them very little information about the other party in the wreck and just assume that the police report will have all the information they will need to set up a claim for there damaged car and their injuries. Experience has taught us that sometimes the police officer doesn’t do a formal report, but simply has the parties exchange information at the scene. So, when does the law require the police officer to do a crash report? Sec. 550.062. OFFICER’S ACCIDENT REPORT. (a) A law enforcement officer who in the regular course of duty investigates a motor vehicle accident shall make a written report of the accident if the accident resulted in injury to or the death of a person or damage to the property of any one person to the apparent extent of $1,000 or more. (b) The report required by Subsection (a) must be filed with the department not later than the 10th day after the date of the accident. (c) This section applies without regard to whether the officer investigates the accident at the location of the accident and immediately after the accident or afterwards by interviewing those involved in the accident or witnesses to the accident. Acts 1995, 74th Leg., ch. 165, Sec. 1, eff. Sept. 1, 1995. Amended by Acts 2001, 77th Leg., ch. 531, Sec. 3, eff. Sept. 1, 2001. Upshot: Ask them to do a report, even if you think you are “OK”. It doesn’t take much to have more than $1000 of Property damage of a car in a wreck. The post Does the police officer have to do an accident report? appeared first on Oberg Law Office.